I found these jeans at the thrift store for $3. 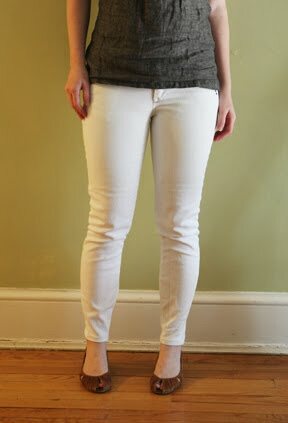 I keep on seeing articles on how white jeans are one of the must haves for the summer. 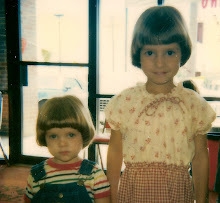 I am a little reluctant but thought that at $3 I didn't have much to lose. 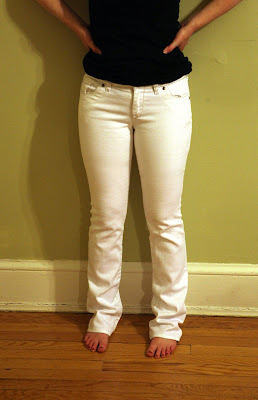 I used Cotton and Curl's tutorial on how to make regular jeans into skinny jeans. It is a great tutorial and you can find it here. I think that they turned out pretty well. Now to have the confidence to actually wear them. You look fabulous in them! Wear them with pride! I love, love, LOVE skinny jeans!! I can't believe you don't have the confidence to rock them! Check out the pics you just posted to the world, honey!! You look fabulous!! Go for it and have fun!! You look great! What an awesome job. 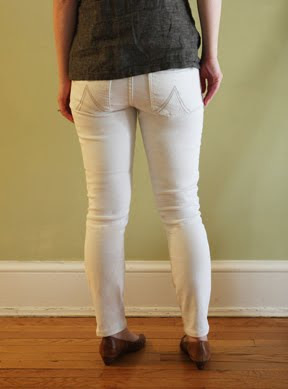 I am intimidated by sewing jeans, but I just might have to try this. What a good idea. Hey Kelli, you looks gorgeous priety woman. It suits your body very much and ya it looks good also. I don't know why you don't have the confidence to wear them. Try it and the white color ROCKS!!! They look great! I will have to try this. Enjoy your summer in San Jose. I like your skinny version so much more than the bootleg. AWESOME job!! To keep your white jeans looking white, you should try ScotchGuard for fabric. I put a nice layer or two onto my baby clothes (and those that I borrow and especially on the ones I lend out) and almost everything has washed right out! Blood? gone. Chocolate? gone. Mud? gone. Boogers? Formula? Barf? all gone! I love the stuff! And when I sew baby gifts, I put on a good layer, let it dry for the recommended 24 hours, then wash it to make it soft, then give it. I've had so many people say that they didn't want to use the items I gave them because they didn't want to get them stained. I tell them that's why I treated them with the ScotchGuard- to keep them cute! Great job on the jeans! They look great! BTW, No, I do NOT work for 3M or whoever makes the stuff. I just love to use it, like my serger. Love this...I have been thinking about how I was planning on managing the whole maternity clothes thing. Thanks for the inspiration! Just Excellent look, you will done a wonderful job.